Mega Man: Battle Chip Challenge. 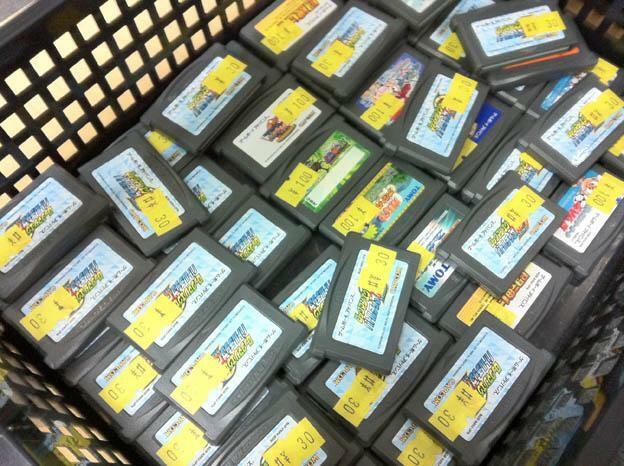 "We've seen cheaper games than 30 yen (about 40 cents) apiece, but never quite so many at one time," writes Parish. "The sheer numbers of unwanted carts in this basket -- about 90% a single title by volume -- means that you could buy this entire collection for about 10-12 bucks and... I don't know. Use them as tiny bricks in your toilet basin to reduce your water bill?" The dominate unloved game in question is none other than Battle Chip Challenge, better known as Rockman EXE Battle Chip GP in Japan. Released in the summer of 2003, the title offered a bit of a tactical twist on the standard Battle Network formula. It's not a bad game per se, but it's very existence was relegated "filler" before the release of Battle Network 4, the most successful title in the series' history. To say BCC was quick cash grab is an understatement. "But don't be sad, Mega Man fans. Battle Chip Challenge has a long way to go before it's regarded as a legendary kusoge (crap game) on the level of Moero! Pro Yakyuu (aka Bases Loaded). It would be tough to take a bath in this relatively small collection of carts." Battle chip challenge in large quantities in discount bins? Why, that's preposterous! You know, I really enjoyed BCC. I think it was a bit lazy with all those pasted-on weapon animations, but the idea of building a deck and leaving the interaction to algorithms wasn't a bad idea at all! Wasn't nearly as good as the main series though. *sigh* I miss the GOOD Battle Network games. HAHAHA, silly Battle Network games. Think about all the buckets of games like this everywhere. Suddenly I feel gypped for spending so much on games at stores! Haha. I've seen this story everywhere, and people keep saying it's must be that Japan tired of the battle network series. You just made me imagine Smithers as Casshern. Yup, seems like Japan finally got over Battle Network if this and Operation Shooting Star's lackluster sales were of any indication. BCC was bad and literally as entertaining as watching paint dry being able to edit a folder and that's it does not make game play. Doesn't this mean people sold the game? It isn't the best one in the series... or even close. @ MushashiAA: Mr. Burns actually called his bloodhounds 'Frienders'? Or am I completely missing something as usual? @ Kenichi: Can't tell if joking. Re-releases and the very odd spinoffs always do badly regardless of series. IHX, anyone? Then again, the main point of them is to make a quick buck with minimal effort anyways, in which I'd rather OSS not have existed in the first place. What if I want a new/sealed copy? The battle network had the best sales of all the megaman series (see the sales of the games on the internet site). Megaman BCC was made by Inti Creates (special!) and it was the only "bad" megaman battle network game, anyways, Inti Creates dont care about the blue bomber. At least they're still selling it... has anyone seen what people did to the Atari ET game? Ahahaha, oh man, you are going to need this. *hands flame shield and then runs for the hills* I want nothing to do with this~! This is pretty sad... I remember how I was so excited as a kid on Easter morning when I got BCC. I played it to death just like any other Mega Man game I got. Friender is the japanese name of Hot Dog. You know, that enemy from MM2. Wood Man's stage. Also, MHX did better compared to PU (both above the 100k sold units). And yet, those are great games. The problem with those games was not the fact they were remakes or rereleases. I still believe it had something to do with the PSP's piss poor popularity compared to the DS. Which is why I believe a PSVita port of MMPU and MHX, plus sequels for both on the PSVita is a very good business opportunity, seeing how the PSVita is a PSP but better. >Developed both MMZ and MMZX series. Developed both MM9 and MM10. unfortunately, it's sights like this that give capcom a reason (excuse?) to be afraid of taking new directions with mega man. i mean, for as many mega man series and games that worked, there are those that didn't too. the power battles series, soccer, battle and chase, rockman and bass 2, X7, the PC series, the rockboard series, super adventure rockman, and is there any more? i can understand why capcom would be afraid to move in a new direction, but LEGENDS/DASH was proven ground. as for BCC, it's a spinoff, of a spinoff. if capcom expected that to go well, they must have been smoking crack. and before i get MMZ and ZX slammed in my face, they are canon. allow me to stuff you in them and fire you. @ MusashiAA : In the beginning of the screen of BCC, you can see the name "Inti Creates", they made one EXE game, and it was the only bad exe game. I agree when you play MMBCC, you have the logo "Inti Creates" in this game, they are the only who make the game with capcom studio 2. Anyways, Inti Creates dont care about the future of MM series (X and Zero killed, and a bad EXE game) lol. I hope really inti creates will disapear from Capcom. You are right. I totally agree with you, Mega Rock. I hope Capcom disappears from Capcom. Inticreates has made 8 of the best Mega Man games I have played in recent years. @anon saying "Inti Creates dont care about the future of MM series (X and Zero killed, and a bad EXE game)"
Everyone dies one day, and machines get rust and stop working, eventually becoming dust as time passes. (Or re-enter the surface) Would you prefer to see X and Zero live for centuries like the Master from Mega Man Legends 2? Always young and energetic? Would they voluntarily be remodeled to look older like the Resistance member Andrew? Zero: "I've been living for 10000 years, and I still don't know what I'm fighting for..."
X: "What did you say? Stop babbling and help me find my leg. I think I lost it in that last wall jump." Zero: "I'm having back pain right now, ask someone else." X: "What? Talk louder or else I can't listen. I think I got deaf because of those darn operators. Specially Alia!" I guess that explains why the game was only $2 free shipping on eBay for me. Well, it's a little nit-picky, but I do believe BCC was released after BN3, not 4 -- the filler between 4 and 5 was the Japan-exclusive 4.5 REAL Operation. I've just confirmed the release dates -- it was a few months before 4 in both Japan and Stateside. Also, I'm not sure about the sales figures, but I would be willing to believe that BN3 outsold BN4. It was probably just a typo on your part. Capcom made so great games, i want to see: Capcom MUST WAKE UP and make new megaman games, i believe it! And yeah, i will buy with import the "We are Rock Men" Album, it's today!!! Nope. Battle Network 4 outsold 3. While 3 did better overseas, 4 sold enough in Japan (like 350k more than 3) to pull itself into the lead by about 50k copies. Plus, Capcom considers both versions of Battle Network 3 to be seperate, since they were released four months apart in Japan. If their sales were combined, Battle Network 3 would be considered the third best-selling game in the entire franchise, pushing X1 to 4th, among other things.